Credit counselling, Consumer proposal or Bankruptcy? I only like one of these options. A couple, in their 30’s, contacts me for a mortgage. They want to buy a new home. She is a teacher, he is a Manager at a computer firm. Incomes are good. I check their credit. Let’s stop here for a minute.. If they had good credit, an approval is simple and we would provide the clients with several mortgage options. But let’s assume that this couple ran into some debt and credit issues 3 years ago… and they made 3 different choices about how to resolve those credit problems. Credit counselling, Consumer Proposal and Bankruptcy. And I’ll bet the results will surprise you…I want to take you through each scenario and show you how long each of these 3 options affect your ability to finance a home..
1. Credit Counselling… So I pull a credit report and see the clients approached a Credit Counseling company 3 yrs ago. There are R-7 ratings on the credit report.. R-7 means you are making regular payments through a special arrangement… usually indicating you are paying less than what you actually owe… Most arrangements last for 5 years. You did the honorable thing and are paying as much as you can without filing for Bankruptcy… Good for you..except this will negatively affect your overall credit rating. In fact, this stays on your credit report for 3 years after the date of completion. ‘A’ Lenders (those with the best rates) will not entertain your application while your are in credit counselling.. they want to see reestablished credit for at least 2 years.. So with credit counselling, it could take up to 7 years before you qualify for a mortgage with fully discounted rates. 2. Consumer Proposal…. This is one step below bankruptcy but the net effect is the same your credit rating. Your credit report will show as an R-7 and some may show as R-9 (meaning they have been written off). A bankruptcy trustee is used to file a proposal to creditors where someone earns good income but can’t afford to make all the monthly payments. This option is used when you have other assets that you do not wish to lose or dispose of. If you have equity in those assets then you may have to choose this option or come up with a better plan to protect those assets, if possible. Unfortunately, the Consumer Proposal will stay on your credit report for 3 years after your final payment. And if you want to buy a house, you must again reestablish your credit for at least 2 years after the Consumer Proposal expires. Buying a home may have to wait for 5 to 7 years. 3. Bankruptcy.. this one is fairly simple to understand… If you don’t earn enough income to satisfy your payments, and if your assets are equal to or less than your total liabilities, then you could be eligible to file for bankruptcy. Bankruptcy is a dirty word to most of us, but it should not be ignored as a possible option. 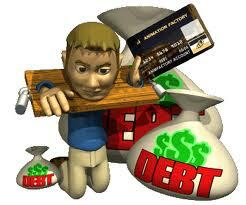 A Bankruptcy will stay on your credit report for 7 years after discharge. It takes around 9 months to be discharged. Here’s the big surprise and little known fact… After your Bankruptcy has been discharged, you just need to reestablish your credit for 2 years and you can once again apply and qualify for a mortgage with as little as 10% down. That’s right, in just 3 years, you could eliminate your debt, start saving for a down payment, reestablish your credit and buy a home… with fully discounted ‘A’ rates.!! So for me, even though I personally respect someone who tries to make good on their debts, it is not looked upon that way by creditors or Banks or other Mortgage Lenders. Two years after your Bankruptcy is over, you can apply for a mortgage with as little at 10% down and get fully discounted ‘A’ rates…. the same as someone that’s had perfect credit all their life and never missed a payment. I’ll bet most people didn’t know that? For me, Bankruptcy is the best option… it eliminates your debts immediately, reduces your financial burden immediately and allows you to get back on the road to financial recovery sooner.. it costs you less. To be certain about your choices, speak with a good Bankruptcy Trustee…. or feel free to contact for more info. Previous Previous post: Rising personal debt levels.. but how about rising asset levels? Next Next post: Another US Govt shutdown… could mean lower mortgage rates for Canada. This excellent Steve, I have this conversation with people every couple of weeks and get the horror stories of proposals and credit counselling as frequently. Please feel free to call or email me if you have any questions, anytime. CanadaMortgageNews.ca Credit counselling, Consumer proposal or Bankruptcy? I only like one of these options.